Are some of our favourite games too long? With every Steam sale, our piles of shame grow to new, unsurmountable heights. If you've got a job or a family or some other responsibility, chances are your allocated gaming time is limited. Games can demand a lot of us, these days—whether it's an overload of sidequests, backtracking, repeat playthroughs to see every ending of a story, or because you're playing a multiplayer game with progression in mind. Here, the UK team discusses whether games are too bloated, and where we draw the line with what we consider good value content versus filler. We'd love to hear your thoughts in the comments below, too. Samuel Roberts: Over the holiday, I finished Nier: Automata, capping off the fifth optional ending after 41 hours of total play. That game was mostly fantastic, but it also felt too long to me. It made me repeat the same story beats in a slightly exhausting second playthrough, which shed some new light on the characters but not enough to justify the hours invested. It finally ended properly with a mostly-great third playthrough, after which I had no desire to go back and mop the sidequests I'd missed. At this point, I'd seen the same grey boxes and washed out greenery that make up its world so many times. I then looked at the other games I'm yet to finish from 2017: Divinity, Shadow of War, Assassin's Creed Origins, which are all pretty lengthy as well. Many of our favourite games are long as heck, now. Some of them earn it, but others don't. Taking something like Arkane's Prey, which I mostly enjoyed, I felt like the last third of the game sent me back-and-forth to the same locations for the sake of it—which wore down the magic of its excellent setting for me. Shadow of War, meanwhile, is a game we called out specifically for being bloated. I wonder if our readers feel this way, that games longer than 20 hours can be more intimidating than exciting. Thoughts? Andy Kelly: I don't mind if a game is bloated, as long as it's fat with interesting things to do and not just obvious filler. Shadow of War's problem is that the distractions that litter its map, whether it's revealing Shelob's memories or purifying Haedir towers, all boil down to following an icon on a map and pressing a button to interact with it. It's design like this that makes a game feel like a checklist, rather than a collection of fun things you feel compelled to do. Watch Dogs 2, on the other hand, features some really fun, unpredictable side quests that I enjoyed as much as the main game, which I wrote about here. Phil Savage: Yeah, the best open world games don't feel bloated, just full of options. But the line between meaningful diversion and tiresome padding can be fuzzy. Shadow of War was the latter for me. I played through the opening area—a small, mini sandbox that offers a small sampling of its sidequests and structure—and couldn't bring myself to continue when I was faced with that but on a much larger scale. Seeing the size of the full map just made me feel tired. I quit out and uninstalled it soon after. Andy: Although I loved Assassin’s Creed Origins, it's guilty of a particularly egregious example of padding. Whenever I finished a story mission, eager to tackle the next one, I'd hit a brick wall. The mission would be two or three levels higher than me, forcing me to complete side quests to get to the appropriate level. Which would be fine if 80% of these quests weren't dull and repetitive. I lost count of how many people I didn't care about that I had to rescue from caves and bandit camps. It's a stain on an otherwise superb game, and really tested my patience towards the end. It took me 28 hours to finish Origins, and I'm sure at least eight of those were spent completing side quests against my will. Samuel: Assassin's Creed is an interesting one, in that I feel almost trained to ignore the majority of the series' side content—ever since those collectable feathers in the original game. Would it have been a great loss to make the level gating leaner in Origins and lose that extra eight hours, leaving it to the player to decide if they're worth it? I don't necessarily think so. Phil: My only hesitance in criticising this stuff is it must appeal to someone, and that someone is essentially me 15 years ago. I used to scour RPGs like Baldur's Gate for every scrap of story, and 100%'d Grand Theft Autos III, Vice City and San Andreas. I even collected those damn feathers in Assassin's Creed II. It wasn't because I enjoyed collectibles—I didn't—but that I wasn't ready to leave these cool worlds. I felt compelled to stay until everything was done. Since then I got a job, and realised there were more games than I could theoretically play in a lifetime—both things that have made me more discerning with how I spend my time. But I recognise that even collectibles, as pointless as they usually are, can add value for some. Samuel: Thing is, I played both San Andreas and GTA III before I had a full-time job and I still didn't 100% complete them. I played them until I'd seen the credits, then just messed around in the open world until I felt done. I accept collecting the hidden packages has value for some people, but as a player, I feel like I've become pretty savvy about breaking down the higher value and lower value content in a game. I know the difference between a sidequest that starts with a cutscene and a three-minute race that's slightly too tricky to be enjoyable. And for me, it doesn't matter how much I love the world of a game—it still has to give me slightly more back in reward (the entertainment value of what I'm playing) than it's asking in time investment. To offer a slightly different example, this week I thought I'd start one of Obsidian's two recent RPGs, which I've been considering for a while. According to my favourite games utility site, How Long To Beat, Pillars of Eternity comes in at 36 hours to beat the main quest line, while Tyranny comes in at 23 hours. Knowing that, I started Tyranny—it's unlikely I'll ever get through both, and even if our reviewers preferred Pillars, I'd rather start something where I know I'll see the ending. That 13 hours is potentially a whole other game I could complete. Tom Senior: I agree with Phil to the extent that I remember enjoying sidequests and working towards secrets in games like Final Fantasy VII. Finding Vincent, breeding gold chocobos, fighting the weapons—that stuff didn’t feel like second-tier content. 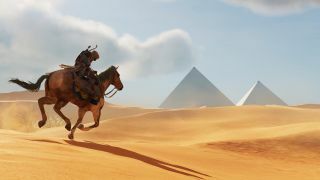 Sidequests and secondary activities in a lot of current open world games feel like an afterthought by comparison, and I think that’s because, in open world games, technology has outpaced design for years. Game engines can do huge, beautiful worlds, but we don't exactly know how to fill them with interesting activities. There are exceptions, obviously, like Skyrim and The Witcher 3, and on consoles last year Zelda: Breath of the Wild and Horizon Zero Dawn. All of these games are full of fun, meaningful side activities that, crucially, don't delay your movement on the critical path. Assassin's Creed Origins' levelling system forces you to engage with the busywork to progress, which is the worst. There are two big honking problem games I'd pick out: Mass Effect Andromeda and Dragon Age: Inquisition. The critical paths in both games are exciting, full of twists, drama, the stuff that BioWare is good at and known for. The open world side missions were drivel that got in the way and stopped you getting at the best parts of the game. Those games, and Shadow of War, define 'bloat' for me, though at least there is a point to Shadow of War having an open world. I reckon Inquisition and Andromeda could have been great relatively linear rollercoaster single player RPGs. Samuel: I can see why open world seemed like the right route for both of those BioWare games. Dragon Age got to show you what felt like its whole world for the first time rather than just snapshots (and it's incredibly impressive to look at), and Mass Effect hadn't really done big explorable planets since the original game. But it's hard to dispute that one reason Mass Effects 2 and 3 were so great is that the busywork was kept to an absolute minimum. Pretty much all of the sidequest content was story-driven. Everyone remembers their favourite loyalty quest(s) from Mass Effect 2. That's one solution, then—linear games are totally okay by us, even if some publishers have seemingly convinced themselves otherwise. And open world games can be long, but that scale shouldn't ever get in the player's way. The more of these games that exist in the market, though, the less attention we can conceivably pay to each one—and the less likely we are to try and do everything. Sidequest design is more important now than ever. Tom: Statistically, looking at achievements, you can see that not many people ever finish games. Games seem more determined to tire us out than to leave us wanting more. Every hour you're spending in a game is an hour you're not spending with one of the game's competitors, and the games-as-service trend allows games to become platforms for microtransactions that can generate long-term revenue. Basically, there are incentives for big-budget games to be massive, but luckily smaller developers are able to create small games that don’t need to meet those big business aims. I wonder if there’s a space halfway for games with big beautiful worlds, minus the giant to-do lists. LA Noire and Shadow of the Colossus spring to mind, focused games that use its open world to create a mood rather than burden us with fetch quests and endless resource collection exercises. I think games are gradually getting better at this, though. The Witcher 3 showed that sidequests can be rich, self-contained short stories that don’t feel like filler. I hope to see more of that sort of thing as open worlds continue to get bigger with each passing year.